Allen's Hummingbird: Small, compact hummingbird; male has straight black bill, glittering green crown and back, white breast, and rufous sides, belly, rump, and tail. 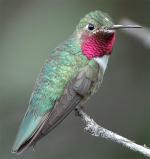 The throat (gorget) is iridescent copper-red. Feeeds on nectar, insects, spiders, and sap. Swift direct flight, hovers when feeding. 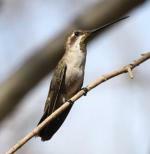 Bahama Woodstar: Medium hummingbird, iridescent green upperparts, violet-pink throat, partial white collar, and mixed buff- and olive-green underparts; may have pink-tinged forehead. Forked tail is black with orange-brown center. Bill is slightly decurved. Direct and hovering flight. Green Violet-ear: Medium hummingbird, dark metallic green (appearing black in low light) with blue-violet cheek and breast patches. Wings have black primaries. Squared tail is blue-green with black band. Slightly decurved bill is black. Direct, hovering flight with rapid wing beats. 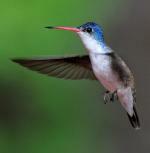 Magnificent Hummingbird: Large hummingbird of Mexican highlands, occurs in limited areas of southwest U.S. Appears very dark green overall, in good light may show blue-green to green throat, purple forehead, gray vent, small but prominent white spot behind eye; tail is all dark. Black legs, feet.